This entry was posted in life, tidbits and tagged life, organization, racing, scrapbooks on November 28, 2007 by Jen. I believe Beth Moore can teach a lot about prayer. I’ve read her “Power of a Praying Wife, Mom, and Woman” books, and adapted some of the prayers into my everyday prayer life. So sorry, that would be Stormie O’Martian! The stress of Thanksgiving has me confused still! If you haven’t read any of Stormie’s books, I highly recommend them to anyone. Now, back to Beth Moore, whom I have read a few books, and done some of her bible studies, including Believing God. Please visit her website at Living Proof to see what she has to offer. I have 2 devotionals from her. Praying God’s Word Day by Day, A year of Devotional Prayer, is so powerful, and speaks to me so often in times of need. No matter what day it is, the daily devo is awesome. I know that I’ve shared some in the past, and I have another one today. You, the Lord my God, are my sun and shield; You, Lord, bestow favor and honor; no good thing do You withhold from those whose walk is blameless (Ps. 84:11). Lord, I can’t claim a blameless walk, but I ask You to please empower me to walk with You faithfully and to never cease pursuing it. Help me, Lord, to hold unswervingly to the hope I profess, for You who promised are faithful (Heb. 10:23). If I do away with the yoke of oppression, with the pointing finger and malicious talk, and if I spend myself in behalf of the hungry and satisfy the needs of the oppressed, then light will rise in the darkness, and my night will become like noonday (Isa. 58:9-10). That just put me in my place. Empower me Lord, to do Your will, and profess Your name. To stand by You, as You faithfully stand for all of us. May my words honor and edify You, may my actions bring You glory. Thank You Lord, that You faithfully love me and guide me, even when I fall short. Thank You, for the gift of Your Son, and the salvation He brought. Thank You for your grace, that I can be saved by faith through Your grace. Thank You for carrying me when I succumb to the pressures, doubts and fears. I have been blessed! This entry was posted in devotions, life, prayer, Scripture and tagged devotions, faith, grace, life, prayer on November 26, 2007 by Jen. This entry was posted in life, tidbits, Uncategorized and tagged life, rants, venting on November 25, 2007 by Jen. For in him you have been enriched in evry way-in all your speaking and in all your knowledge-because our testimony about Christ was confirmed in you. Therefore you do not lack any spiritual gift as you eagerly wait for our Lord Jesus Christ to be revealed. He will keep you strong to the end, so that you will be blameless on the day of our Lord Jesus Christ. God, who has called you into fellowship with his Son Jesus Christ our Lord, is faithful. Paul was writing to the church in Corinth, and basically calling on them to be holy, and put their spiritual gifts to good use. He called for them to change their attitude. I find that I need Paul to remind me of this as well. Sometimes it’s easy to get stuck in the mud, and spin your wheels, than to change your attitude and put your faith in God. I encourage you to write this down, or make it your memory verse for the week. Our God is faithful, and he saved us through his sacrifice of his only son. For more Sunday Scripture, please visit Amy at www.sabennett.com/wp/. This entry was posted in life, Scripture and tagged faith, life, Sunday scripture on November 25, 2007 by Jen. Glory in his holy name’ let the hearts of those who seek the Lord rejoice. He confirmed it to Jacob as a decree, to Israel as an everlasting covenant. to nation, from one kingdom to another. He allowed no one to oppress them; for their sake he rebuked kings. Do not touch my anointed ones; do my prophets no harm. and he sent a man before them- Joseph sold as a slave. princes as he pleased and teach his elders wisdom. he sent darkness and made the land dark- for had they not rebelled against his words? that they might keep his precepts and observe his laws. We must seek Him daily, with earnest, and with all our hearts. Otherwise we will experience spiritual weakness, and that leaves an opening for satan to slither in. Ask and expect great things from God, and He will show you his grace and power as you see His presence daily. This entry was posted in life, Scripture and tagged faith, life, Scripture on November 24, 2007 by Jen. We awoke, we froze, we ran, we watched them hand out the last right in front of our eyes, we were sad, we moved on, found some small things, drove somewhere else, stood in line for an hour and 40 minutes, (this time in the warmth of a store,) and we concquered! I’ve been toast the rest of the day! That pretty much sums it up…. This is one of the craziest things I have ever started, but I continue to do it. Early in the week, I was excited, and looking forward to shopping. Last night, after cooking all day, it was not top on my list. I was looking at the ads and making my plan around 1 am. Luckily, I had only one big ticket item for all 3 kids, and two stores had them on sale that were close in proximity to each other. One opened at 6, the other at 7. I thought it would work. I believed. And it did! I shared this honored tradition this year with my daughter. Her first time to do Black Friday, I woke her up at 4:30 am. She popped right up! Why won’t she do that for school when she gets 2 more hours of sleep?! Anyway, we stood in line outside of Target for 1 hour and 12 minutes. Did I say that it was 28 degrees? Yeah, a bit cold. Actually, I swear my feet were frostbitten, because they hurt so badly. When they finally opened the door and we had to run, I wasn’t sure I could. But Brooke drug me! She was great! The fave part of that store is the warm Venti Chai Latte from Starbucks. Yes, Venti. It was so good! We only made it to 3 stores, but it was very productive. I want to say kudos to my friend Tiffany, because she was the ultimate power shopper. She was out yesterday morning, and today as well. Go Tiff! We came home and I took a nap. Then Brian and Zach left for the woods again, and I had a funny thought. I always make fun of them for getting up at 5 am to go and sit out in the woods…………..but I got up at 4 am to stand in line outside of Target to get a bargain………when they go, they wear wool socks, thermal underwear, and insulated clothing and coveralls…………I had jeans, T shirt, tennis shoes, and a coat………mental note to self-Don’t make fun of them again! Plans for tomorrow- My mom and dad are going to Red Lobster to celebrate their wedding anniversary. They asked us to come, but I’m so tired, and have some dishes to finish up, and Brooke is really wanting to get the Christmas stuff our. I don’t know yet what we’ll do, because I want to see them. I guess tomorrow is today now, so I should sum it up. I had fun with my baby girl today, and she is growing up so quickly. She amazes me! It’s something we don’t get to share a lot because she’s so busy with dance. I’m trying so much to instill a strong faith in my children, and pray they seek the Lord with all their might. They are all such a blessing to me, and I feel the weight to teach them these things. It seems that Thanksgiving and Christmas are difficult times for my husband, and I just pray fervently that his heart will be open to receiving Christ. That we can share the power of the Holy Spirit in our family, and praise God for everything. Blessings to you all! This entry was posted in Black Friday, life, prayer and tagged blessings, faith, life, prayer, shopping on November 24, 2007 by Jen. Now that I’ve eaten, I can tell you all about my Thanksgiving. We chose to start our own family tradition, and stay home. My parents were both great about it, and very understanding. My dh didn’t tell his parents until the last minute, so there were some hard feelings, I think. I really hate that! I’m sort of a holiday perfectionist. I want everything to BE perfect. Of course, that only sets me up for disappointment. I should know that by now. But the day started off good. I slept in, and then was able to watch about half of the parade before I started cooking. I had helpers in the kitchen, and that was fun. I had to let go of the control, and let them do their own thing. Brooke made a wonderful pumpkin, chocolate cheesecake, and a different tasting banana salad. Zach made a yummy pumpkin pie dip, and we ate that with shortbread cookies. I had made deviled eggs the night before, so I started the green beans with ham, and the potatoes. I put the mashed potatoes in the crock pot on warm for the rest of the day, and that was so easy. I put together my grandma’s dressing, so it was ready to go in when the turkey came out. Zach and I tackled the turkey into a roasting pan, and removed the “contents of the bag”. I’ve never cooked a whole turkey before, so I had several different recipes that I was following, and sort of made a combination all on my own. I patted it dry, stuck my hand between the skin of the breast, and then put butter in that space. I then rubbed it down with olive oil, and added rosemary, thyme, salt and pepper. I put stalks of turkey under the turkey, several around it, and a few stalks inside it. I also cut up two large onions in chunks, carrots, and whole heads of garlic. I place those around the turkey as well. I stuck a few inside the cavity, with more rosemary and thyme. I began the roasting at 425 degrees for 35 minutes, until the skin was a golden brown. Then I lowered the temp to 350, and loosely placed foil over the the turkey. I cooked it for about 3 more hours, and when the temp was perfect, removed it to rest. I then started the dressing, and sweet potato casserole. The noodles and gravy were started then as well. Everything was done about an hour after it was supposed to be, so we were all very hungry. And it was all very good. I’m pretty sure that my grandma does something very secretive with her dressing though, because I have made it twice now, and it doesn’t even compare. For my tablescape, I went outside and collected some pretty red, yellow, and brown leaves. 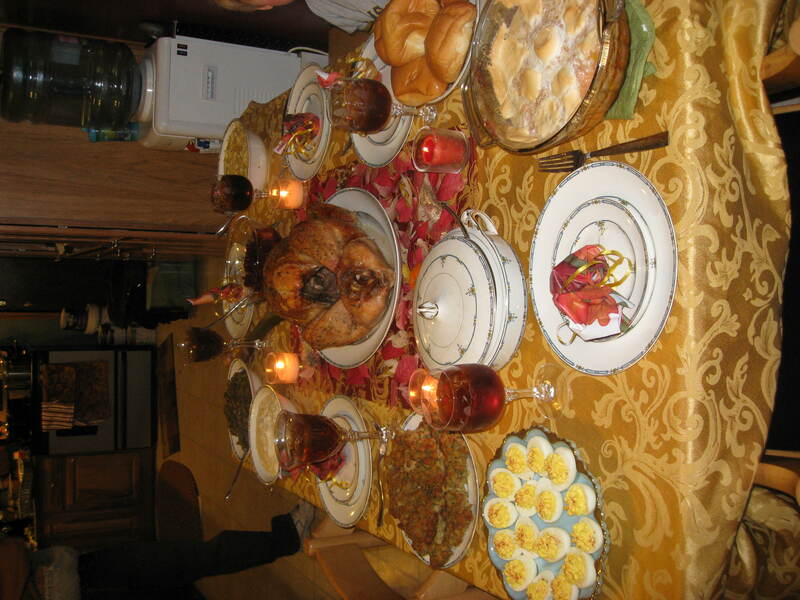 We put the gold tablecloth on the table, and a pretty autumn cloth napkin in the center of the table. I placed the leaves on that, and put a votive on each corner. The turkey platter went over the leaves, and at each end of the platter was a small clementine. (To look like a pumpkin…) Yeah, so I’m crazy. We ate off of the china, and drank our iced tea from crystal goblets. It was a very formal affair! Oh, and I almost forgot the bags. On each plate there was a small bag tied with a gold ribbon. Inside were 5 kernels of corn, and beside the plate was the Legend of the Five Kernels, typed on cardstock. I found that idea on the web, and the kids really liked it. I’ll do it again next year. Everyone helped clear the table, and I had to HANDWASH the china (really didn’t think that one through!). Along with the homemade desserts, we had a pumpkin pie and pecan pie. Boy were we stuffed! Aside from Zach and I both having a meltdown simultaneously, and sitting in the middle of the floor crying, I think it all went well. Did I mention that Matthew spilled his iced tea two different times? Once it went on the tablecloth and Zach’s legs, and the other time just the tablecloth again. But it’s just a tablecloth, and it can be washed. I didn’t freak out about it, and he was so cute wanting to clink glasses with Zach. By the grace of God, we started a new family tradition, and it was good. Many thanks were given. And then we went to bed. Because that’s a lot of work! 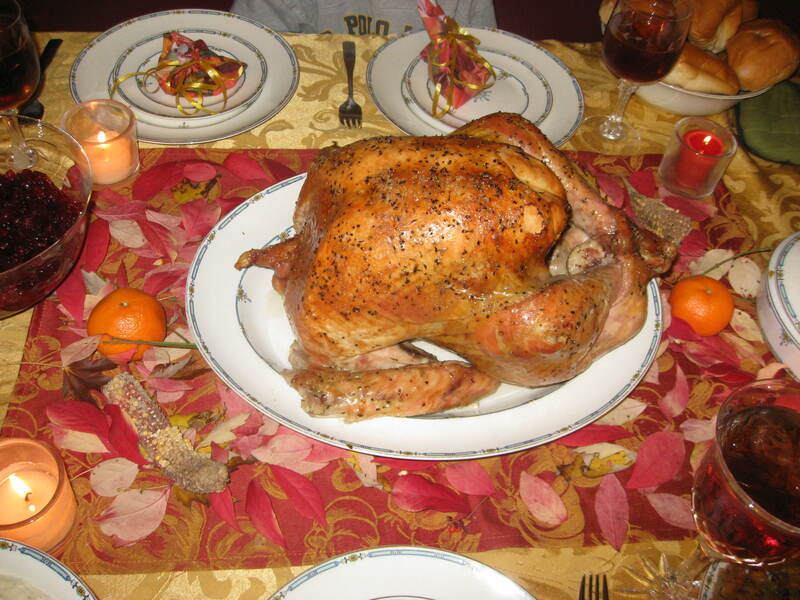 This entry was posted in Cooking, thanksgiving and tagged thanksgiving, Turkey on November 23, 2007 by Jen. I have spent some time reading the FAQ and the forums, and see that I am not the only one encountering problems uploading my pictures. I found a few tips , and will now try them out. I so want you to see my turkey!
) Wow…lots of work, blood, sweat and tears later. I can see them, and sure hope you can too. Just looking at the pictures has made me very hungry. Please excuse me while I go eat some left overs! This entry was posted in Cooking, thanksgiving and tagged Cooking, gratitude, thanksgiving, Turkey on November 23, 2007 by Jen. I have been trying for a few hours now to upload some food photos, and I have come to the conclusion that I am computer illiterate. The only thing that I can accomplish is uploading the full photo. It seems everyone who wants to do that on purpose, has trouble with only a thumbnail coming up. I’ve tried, but now I need sleep. In less than 4 hours I’ll be out in the cold for Black Friday. Hope you had a wonderful Thanksgiving! I’ll try to figure out the uploading stuff later today, and let you know how my first turkey was! 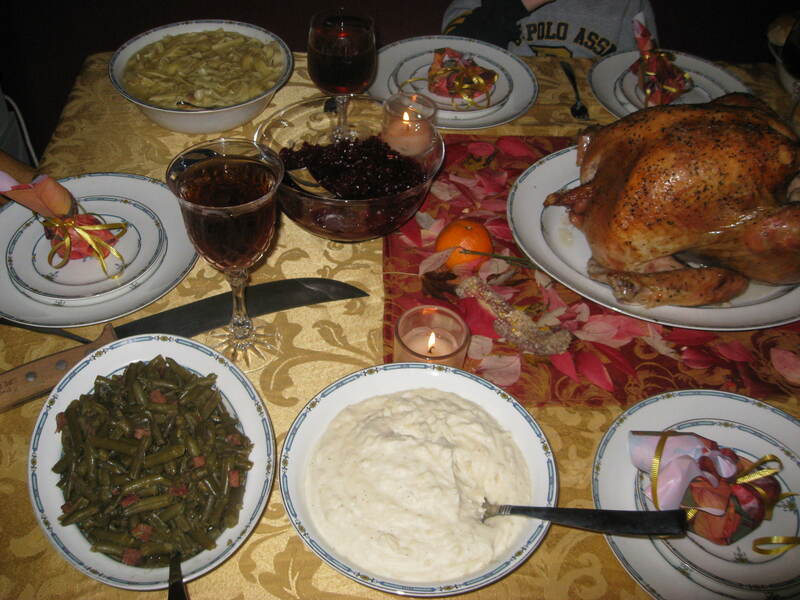 This entry was posted in Black Friday, thanksgiving and tagged Cooking, gratitude, thanksgiving, Turkey on November 23, 2007 by Jen. I just wanted to share a quick devotion from Beth Moore’s Praying God’s Word Day by Day. This one is from last week, on the 14th of November. BELIEVE EVEN WHEN YOU DO NOT FEEL. KNOW EVEN WHEN YOU DO NOT SEE. HE GAVE THE LIFE OF HIS SON TO DEMONSTRATE HIS LOVE. Lord God, Your Word says that You love the just and will not forsake Your faithful ones. They will be protected forever (Psalm 37:28). My justification is found in Your Son, my Savior, Jesus Christ (Romans 8:30). He is faithful even when I am not (2 Tim 2:13). Thank you, Father, that I can be absolutely sure You will never leave me or forsake me, because I am in Jesus (Heb. 13:5). O God, how I THANK YOU that a lack of faith will never nullify Your faithfulness (Rom. 3:3). You will remain faithful, for You cannot disown Yourself (2Tim 2:13). Lord, help me to know that I belong to the truth, and set my heart at rest in Your presence (1 John 3:19). He is faithful, I am free and my heart is at rest, because of Him! Thank You Lord! This entry was posted in prayer and tagged devotions, faith, prayer on November 20, 2007 by Jen.